Over the past few days I’ve put together a module that implements yet another showcase. 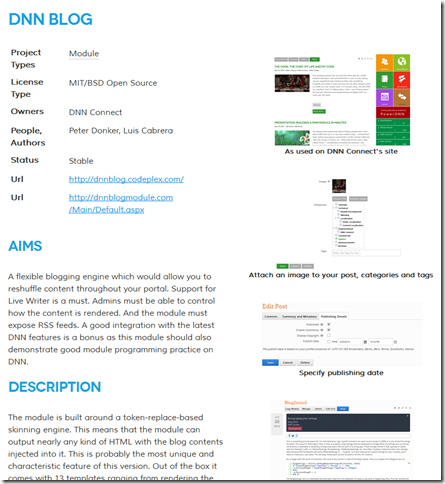 “Showcase”, here is similar to what the “Forge” does on the official DNN site. Why would I do this? Good question. 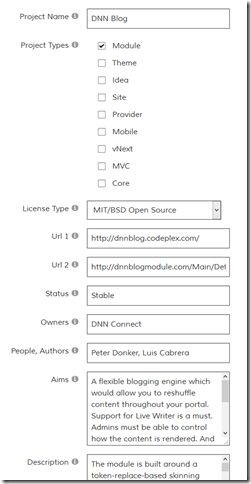 What provoked it initially, was the upcoming DNN Connect 2015 conference and my desire to allow people to “showcase” their work/ideas. What I had in mind was what we dubbed “poster sessions”. Basically the ability to put up a poster on a wall in a predetermined format. Now we could just say: OK people, “you can bring an A2 poster to the event and we’ll put it up” but then we’re going to get all kinds of formats (some have more time and creativity in this respect than others). So to level the playing field I was thinking: what if we had a database that could flow into a PDF template? The second reason I set about programming is that I was toying around with the idea of a blend of some technologies into a module. Specifically Razor, Angular and PDF generation. To start with the latter, the kind people at Syncfusion now offer a Community license for their components including the PDF generation component. Razor is something that is fast replacing everything web forms and Angular is by far the most talked about client side framework at this point in time. So how would all this play together in DNN? This question plus the fact that I had a lull in activity meant I took to Visual Studio to piece it together. 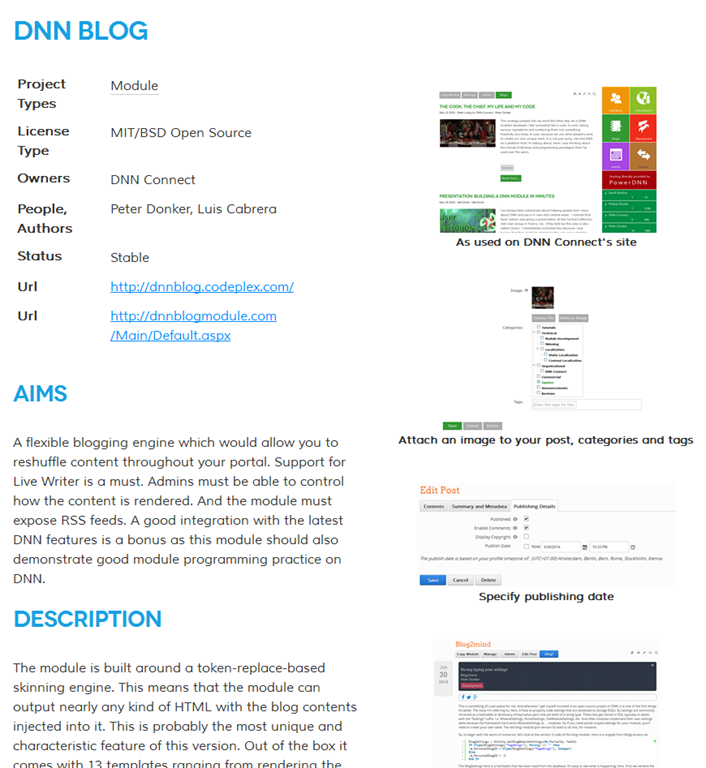 So what we have is a fairly simple module with a fairly simple (but not trivial) data structure that allows you to submit your project to our database. What we intend to do is to select a number of these to be printed and hung up at the event. Note we’re still not committing to printing this ourselves (it depends on how much budget we still have). So maybe we’ll ask you to print it yourself from the downloadable PDF. We’ll see. But in any case it should also build up a nice selection of stuff on this page on our site. So to submit your project you first need to log in and be a member (note that everyone who’s registered for the conference is now a member as well). Then you should see the “Add” button on the showcase page. This will take you to the edit page. Project Types: Select the applicable types for this project. Note that if you really miss something I can add this to the list. Just let me know. License Type: I’d like to make it clear if this is intended for commercial use or not. I’m not against commercial stuff, but it should be clear and the color coding of the projects on the listing page is related to this. Status: This is obviously not static. But you can leave a word or two about what the status of the project is. Is it just on paper right now, beta, or released? This helps against any disappointment of people heading over to the url and finding nothing there yet. Owners: Which entity is behind this? Can be an individual as well of course. People: Related to the above, but who are the people that are behind the project? Aims: What is it that you are trying to solve/address with this project? Feel free to enumerate. Description: The main summary of what this project has achieved. Related to the above, of course. Dependencies: List any dependencies that we should be aware of. DNN version? 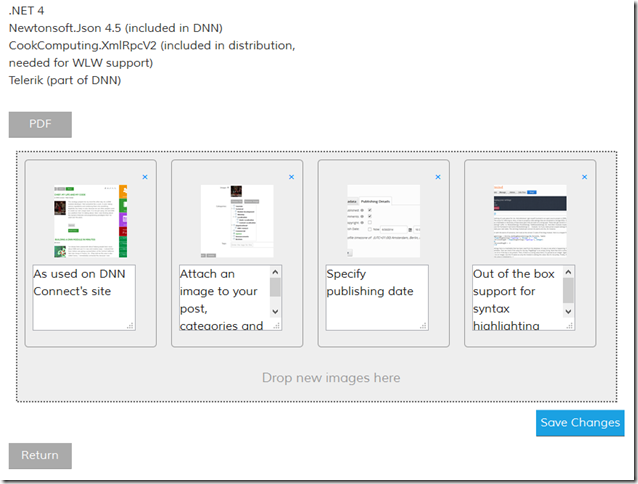 At the bottom of this page you can manage a small image library for the project. Images will be automatically resized. You can drag the images around and add a caption. Note you should click “Save Changes” if you’ve changed captions or the order for this to be saved back to the server. Your project is now ready for us to review. We will see it but not others. As soon as we feel it’s ready for publishing we’ll OK it and it will be visible for all. Note you can download the PDF right away. This will give you feedback if you’ve managed to keep things concise. If you’ve added too much text in the open text fields or if you’ve added too many images, the content will overflow the first page of the PDF and we can’t use it as a poster. So check this and readjust if necessary. Finally: I will probably make some more tweaks to this module in the run up to the event (I haven’t implemented filtering or search yet, for instance). So I can’t promise things will look exactly like on the screenshots in this post. But your data will remain there and we will keep this on our site even after the event has finished. 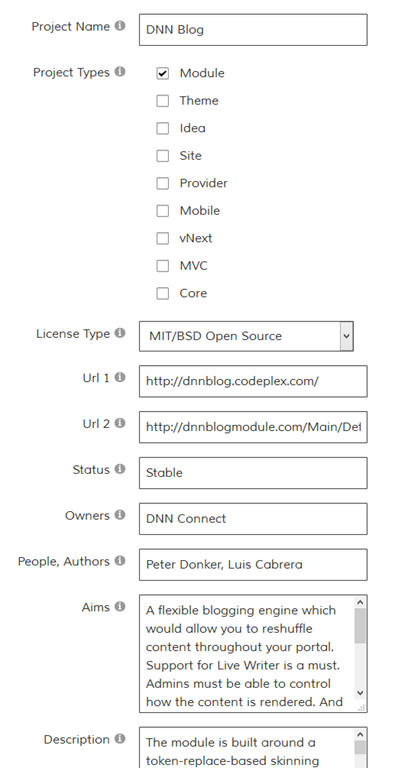 So even if it is not selected to be hung up at the event, you will still have visibility on the DNN Connect site. 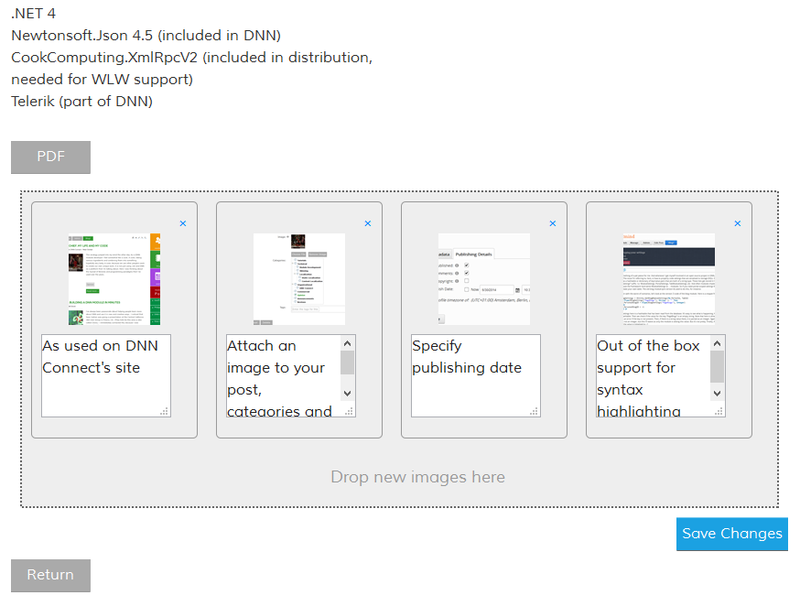 Please take a little time to submit your projects and show the world what it is that we do with DNN! Tony Henrich Peter.. it's time you move to C#. Everyone has except you :) There are rumors that MS will not support VB.NET some time in the future because of the big drop in vb.net developers. Peter Donker Tony, I coded some stuff in C# and I work on the core code from time to time. It really is a lot like natural languages in that after a while you "get into the groove". The reason I go back to VB from time to time is that my code templates are still all in VB. And given that I really don't see any difference other than syntax, I reserve the right to just code in VB or C# depending on how I feel on the day.